If you've gone shopping for women's plus size jeans recently, you may have been pleasantly surprised to see how many manufacturers have finally realized that real women are not, for the most part, a size 0-3! It used to be frustrating - seeing so many petite and cute options, but now most of those options have been adjusted for women with curves. A statuesque body doesn't mean having to wear a gunny sack anymore! First, stretch jeans are great for plus size women. They give and take according to your body changes without making you uncomfortable. Jeans are supposed to be a casual affair - something that you can play and LIVE in. Having said that, there is no real reason for buying elastic waist jeans anymore unless that's your personal comfort zone. 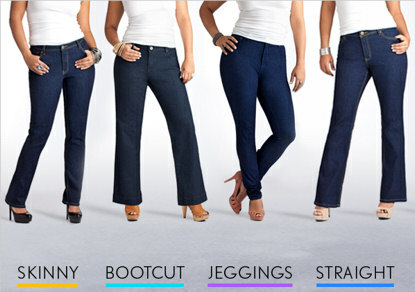 Styles in women's plus size jeans have really branched out - so try on several to see what flatters your figure the most. Another simple fashion tip for Women's Plus Size Jeans purchases is staying with darker colors - black and blue. Quite simply dark colors are slimming and they mix and match with nearly any top in your wardrobe - and are particularly flattering with simple, neutral tops. For tall plus size women, it's best to avoid a cropped style pant as that draws attention to attributes you'd probably rather tone down. Likewise, if you have a rather conspicuous behind - avoid jeans with heavy decoration in the back. Women with prominent thighs can look to either flare jeans or boot cuts to draw the eye downward. No matter what, you want a well-fitted jean - but not one that's saggy. Sags do nothing for showing off the best attributes of plus size women. Because fit is so important, buying over the internet may not be the best way to approach shopping initially. This is fine once you discover a line and size/style that really works, and saves you money thereafter, but initially trying pants on in person is really the way to go. Take notes home with you - then go bargain hunting! If you really want to shop the internet for women's plus size jeans review the sites return policies carefully, particularly any notes about restocking fees. This protects you if the product is substandard or just turns out to have been the wrong choice. Happy shopping! 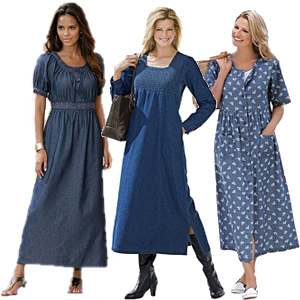 are widely available and very popular with plus size ladies for casual blue jeans. Unless you live on a deserted island the word "Levis" is nearly synonymous with jeans. The world of style is filled with wordiness: yokes and frays, distressed and vintage - when all most people want to know is how to find a pair of decent designer jeans that fit your life and your personal tastes. Lee Jeans became multi-national in the 1960s. 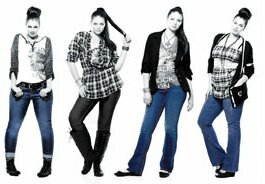 This boost them into the enviable position of leading the women's jean market, particularly for their plus size styles. Unlike some companies with very limited options, Lee offers plus size jeans in everything from a Capri, crop, stretch denim, distressed look, boot cuts, and old-fashioned hippy bells. Skinny jeans also sometimes called cut and fit jeans have designs intended to fit snugly, not too tightly. Most brands use stretch denim for this purpose so the fabric forgives those normal changes in body weight while also keeping the overall feel of the pants comfortable. There is something "cool" about flare jeans. They feel down-to-earth and whisper of the 1960s without quite so much tie dye. The best part about owning a pair of flare style jeans is that they're versatile. Tall women know how hard it is to find a good pair of jeans. Many of us end up looking at tall plus size jeans due to either having long legs or a long torso that creates awkward sizing configurations. are the ideal addition to a full-figured woman's wardrobe. They also make their line in junior sizes so that young women who develop early can feel good about their clothing and their body. Stretch jeans integrate fabrics like Lycra that naturally show off your shape and give everything a proverbial face lift with support in all the right places. A woman with curves still wants to look like a women and may be hoping to find seven plus size jeans because they're so popular.